I borrowed this book from Zurich library and loved it, so now have my own copy. Will re-read and probably send out on a bookring, but the book will eventually be part of my PC cos I love Matt Beaumont!! 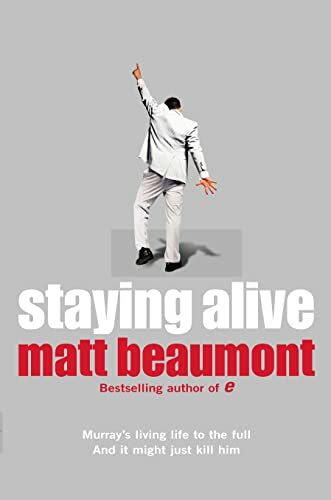 From the bestelling author of 'e' comes a hilarious and moving novel of a very normal life becoming extraordinary Murray's living life to the full -- and it might just kill him. He's started telling the truth at work. He's borrowed a stack of cash from a man with a gun, a speech impediment and no grasp whatsoever of APR. He's also taking drugs and -- God help him -- he's started dancing. Badly. To trance. And now he's on the run with a human version of Muttley and a teenage girl called Fish. Which is strange, because a few weeks ago Murray didn't even burn the candle at one end. But when his doctors tell him he has only months to live, he gives his boring old self the boot, relaunches a new, improved Murray and falls in love with a passion he didn't know was in him. His old self, of course, would tell him he's digging his own grave. But he'll be needing one of those soon enough anyway, won't he?